Harsh winter conditions led to much winter wheat injury and kill this year, reducing stands as well as competition with weeds. Even fields that were treated with herbicides have weeds due to the thin stands (Figures 1 and 2). Figure 2. Post-harvest weed management will be critical in reducing weed seed in the field and weed competition in the next crop. Now many winter wheat fields have rather large broadleaf and grassy weeds and have received harvest aid treatments. If weeds are cut off with the combine at harvest, you will need to let them regrow before herbicide application. Timely control of weeds following winter wheat harvest can limit soil moisture loss to weeds and prevent the deposit of more weed seeds in the soil, two factors that can benefit the next crop's yield. In addition, timely control of volunteer wheat is essential in reducing the spread of wheat streak mosaic disease. weed control in the growing wheat. streaks caused by sprayers, terraces, dust, straw, and chaff. The amount of residue from this winter wheat crop affects how the next crop will compete with weeds. Figure 3. The effect of winter wheat crop residue levels on weeds in corn following winter wheat treated with herbicides post harvest. In general, 1 bushel of wheat produces 100 lb of crop residue or 60 bushels of winter wheat equals 6,000 lb of crop residue. Weeds under stress are difficult to control, however, this may be less of a problem this year as many areas have excellent soil water. It's a general rule that you can wait up to 30 days after harvest to spray wheat grown as part of a three-year rotation. If the wheat was planted without an 11- to 14-month fallow period, spray it within 15 days of harvest. Examine each field separately and adjust your treatment schedule accordingly. This year some fields will need to be sprayed before 15-30 days because of the less competitive winter wheat stands and higher precipitation amounts in many areas. The key is to prevent weeds from using soil water and producing weed seeds. As with all weed control, it's essential that you closely watch for weed developments and spray at the proper time to achieve maximum control. Most labels state that weeds must be treated before they are 6 inches tall. If weeds are under severe drought stress, wait for rain and spray about a week later. 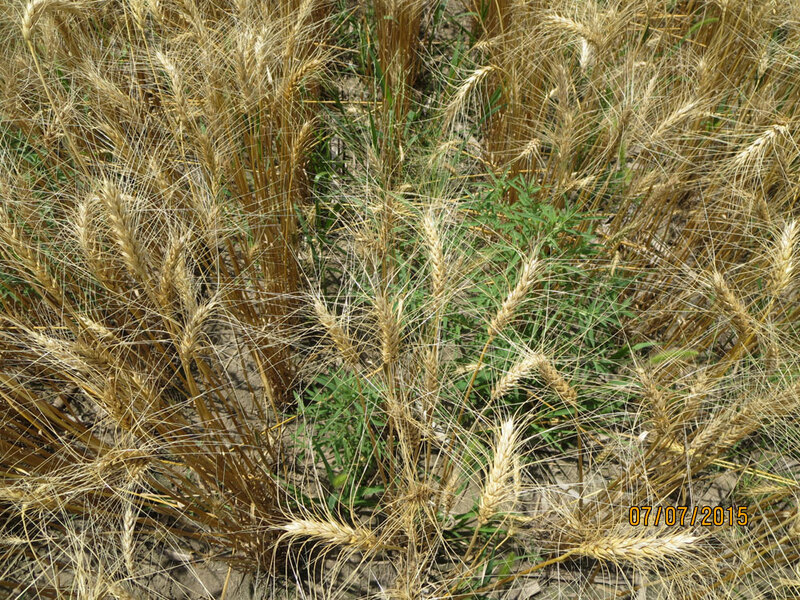 Controlling weeds in the growing wheat offers the best chance of reducing weed population and vigor after harvest. Prepare a good firm seedbed. Control weeds in a timely manner. Plant at the optimum time. Select a competitive winter hardy winter wheat variety. Split treatments, which have a good history of effectiveness, should be especially beneficial this year. In Kansas, there was a 20-bushel increase in corn yields the next year for treatments applied in July vs. mid-August. When using a split treatment, apply the glyphosate products with companion herbicides (adding surfactant, if needed, plus ammonium sulfate) as the first application in July or early August. Some glyphosate products include sufficient surfactant while many products require more. Be sure to check the product label. For all glyphosate brands, add ammonium sulfate (spray grade) at 17 lb per 100 gallons of spray solution. (The ammonium sulfate is the first item put into the spray tank after the water.) Ammonium sulfate is especially helpful when stress conditions are present. Liquid ammonium sulfate, with or without a drift retardant, also is available. It's difficult to recognize weed stress so it's wise to always add ammonium sulfate. Improve control by increasing the rate of glyphosate. Allow at least six hours — and longer with some weeds — for the glyphosate product to become rainfast. Barnyardgrass may require 24 hours without rain for maximum control. With glyphosates, use a spray volume of 5 to 10 gallons per acre and don't apply when temperatures reach or exceed 95°F. Producers should control weeds in wheat stubble fields by applying the full label rate of glyphosate with 2,4-D or dicamba to the glyphosate unless susceptible crops or other sensitive vegetation are in the area. Other herbicides that may be added to glyphosate include Spartan, Charge, Authority, MTZ, Valor, and Sharpen. Tank mixes with glyphosate will help control weeds that are difficult to control with glyphosate alone and will help reduce the chances of developing glyphosate-tolerant weed populations. Always check labels and rotation restrictions. If temperatures are above 80°F, use the amine formulation of 2,4-D and dicamba. For additional information, treatments, and rates go to the Ecofarming Section of the 2015 Guide for Weed Management, EC130. The second part of the split treatment should be applied in September. It should contain at least 0.5 lb per acre of atrazine and possibly Gramoxone Inteon (add surfactant), depending on the amount and size of volunteer winter wheat, downy brome, jointed goatgrass, or other weeds present. Several options are available for using nonselective herbicides with difficult to control weeds. With Gramoxone Inteon, use a minimum of 2 pints of X 77, or equivalent surfactant, per 100 gallons of solution. Use 2 quarts of X 77 per 100 gallons of spray solution if using less than 20 gallons of carrier. The active ingredient varies among products so check labels and adjust rates accordingly. The atrazine rate varies with soil and rainfall patterns. In southwest Nebraska, use 2 quarts of atrazine per acre unless the soil or the following crop limits the rate to a lower amount. In the Panhandle the maximum allowed in one season is often 0.5 quart per acre. Volunteer Wheat and Grasses. The advantage of split treatments is that they provide excellent control of volunteer winter wheat and other winter annual grasses. Using one quart or less of atrazine before September 10 allows winter wheat to be planted 12 months later in most areas and soils. If sufficient soil water is available the following spring, corn could be planted or if moisture is limited, the field could be fallowed and winter wheat could be planted in the fall. Downy Brome. If downy brome is a problem and a winter wheat fallow rotation is being used, tillage is usually recommended immediately after harvest to plant the seeds and ensure maximum weed germination during the fallow period. Do not till if only a limited amount of crop residue is present after harvest since tillage will make the soil susceptible to wind and water erosion. Herbicides are available to control downy brome in the growing winter wheat and are best applied early. If jointed goatgrass and/or feral rye is a problem, use a rotation where wheat is not planted for at least three years under good moisture conditions and even longer under dry conditions. Jointed Goatgrass and Feral Rye. Herbicide-tolerant winter wheat varieties are available for fields with jointed goatgrass or feral rye problems. Beyond™ herbicide is then applied in the growing wheat. (Grower training is required before this herbicide can be purchased.) Check the label for additional information.